That money is mostly staying in India bar some raw materials and the cost of the AESA radar and SPJ pod. Comparing it to the fly away costs of the Rafale is pointless!! In the former case, of the LCA, you are building up a long term aerospace complex for a fraction of the cost, assembling the Rafale in India would have cost and laying the foundation for the AMCA. Instead you would have us mortgage that for a few more Rafales? Further, by reducing the already limited number of LCA in assembly by halving the MK1A order, you further drive up the cost if the program when evaluated on a per unit basis, making the proposal completely unworkable from an economic perspective. Karan M wrote: The prices will definitely include cost of the project at HAL, logistics, and won't just be airframe fly-away costs as you are assuming. Basically its the (program cost (to HAL) + actual cost of each aircraft + additional items + HAL margin) divided by the number of airframes. Since, 89% shares of HAL are held by GOI/President of India and remaining 11% by investors, to a large extent for GOI, this is money going from one pocket to another. However, this money circulation at the level of 600 Crores/Tejas rather than at a smaller amount of say 300 Crores prevents the difference of money benefitting something else. So, one should expect future HAL profit (~ 2000-2500 Crores/year since last 4FYs) to go up significantly as program and project costs are sunk costs. This ineffective money circulation begs the question what else we could do with money idling in account. If indeed, 600 Crores/MK1A is an agreed firm contractual rate, wouldn't IAF (the customer) want much more capable and cheaper Rafale than MK1A. So, rather than 83 MK1As of per fighter at 600 Crores, how about, 2 squadrons of MK1AS (36) and 3 squadrons (48) of Rafale. (Yeah, 3rd squadron at Andaman). Of course, there is a consequence in terms of investment in indigenization versus investment in air-dominance capability but 36 MK1As can always be later complemented with more MK1As/MK2 in 2025-2030. I feel, money is being locked up. Good thing with the higher price is if ever Tejas gets exported, Desh gets the benefit but whether Sri Lanka, Bangladesh, African countries would like to order Tejas who is as expensive as Rafale or Sukhois but is less capable. I for one would like to order 2 JF-17 Bundars than 1 Tejas in the same price, wouldn't you? There is no way that IAF/babus will pay more than 1.5x for MK1A than what they are paying for LCA MK1 FOC. This 400 crore per plane cannot be The flyaway cost. IAF/MOD created a committee to look into the price escalation by HAL for MK1A. Nothing has come out which suggest that the committee found any discrepancies. Indranil wrote: There is no way that IAF/babus will pay more than 1.5x for MK1A than what they are paying for LCA MK1 FOC. This 400 crore per plane cannot be The flyaway cost. IAF/MOD created a committee to look into the price escalation by HAL for MK1A. Nothing has come out which suggest that the committee found any discrepancies. Did you mean "Nothing has come out which suggest that the committee [has not] found any discrepancies"? Folks This military forum. Discussing costs doesn't help anyone. HAL prices the Tejas and MoD buys. Nobody else's business. We talk performance, delivery schedule and achievement and weaponry. Cost and price may can be with motivated journalists. Thanks for thread hijack. No more into this rabbit hole. ramana wrote: Jayram, Congratulations for being part of Tejas development at a young age. And even more for using knowledge about Aluminium Alloys and grain refinement with micro alloys. Thanks Ramanagaru. A small effort done a long time ago is still etched clearly in my mind. HAL executives were equally appreciative giving us access and a tour of the Dhruv /LCA and virtually every other shopfloor and hanger freely. Rakesh wrote: RKumar, I would love to join you for that Japanese Single Malt Whisky! Tell me time and place please I will bring some Glenfiddich single malt scotch as well! Feels like I´m the oldest one here. I remember reading about the LCA in a Jane´s book in the 80´s about future fighters, It feautured a Gripen in a smashing splinter-camoflage alá Viggen, it also had an Israeli fighter called "Kfir" (wich was ¨the name of a fighter in south america but the real Kfir turned up in China), a yuogoslave fighter which was a a one engined Rafale and a really cool Swizz fighter that was suppose to replace the F-5, Of all those, today only the Gripen and the Chinese Kfir is operational today. LCA this year? tejas has been operational since IOC a few yearsback. it was a stellar performer at IAF's mammoth gaganshakti exercise last year. Wickberg wrote: Feels like I´m the oldest one here. I remember reading about the LCA in a Jane´s book in the 80´s about future fighters, It feautured a Gripen in a smashing splinter-camoflage alá Viggen, it also had an Israeli fighter called "Kfir" (wich was ¨the name of a fighter in south america but the real Kfir turned up in China), a yuogoslave fighter which was a a one engined Rafale and a really cool Swizz fighter that was suppose to replace the F-5, Of all those, today only the Gripen and the Chinese Kfir is operational today. LCA this year? LCA is already operational and in squadron service with IAF. If by service you mean having the Final Operational Clearance (FOC), version, then yes this year it is. FOC has been achieved and production go ahead has been given to HAL. So this year FOC Tejas will roll and soar !!! Considering the figure of 670 crores for the basic rafale, from this interview of SuSri Sitharaman, this LCA will be still a bargain. Esp. if it can mount the meteor at some point in time. Can we ban use of words "LCA" or "Tejas" and "Meteor" together in one post...? HaHa.. why? weight wise, the missile does not appear exceptional. Are there some other requirements that preclude carriage by the LCA? sudeepj wrote: HaHa.. why? weight wise, the missile does not appear exceptional. Are there some other requirements that preclude carriage by the LCA? Interesting especially cause I saw a JF-17 in colors other than PAF. Time for the business to drive the Tejas to its final operating altitude. If necessity is the mother of invention then surely competition is the father of improvement. Nice! The LCA Tejas heads to Langkawi, Malaysia for LIMA 2019 in March, its 2nd foreign sojourn after the Bahrain Air Show in 2016. Will be part of the flying display. HAL needs to engage the likes of Royal Enfield/Mahindra/Tata to build an export oriented manufacturing & service mindset. Merely building a platform (however big an achievement it may be) isn't enough when it comes to a complex relationship like one would have with a customer of fighter platform. Let's get our own order done, and our house in order so we can have order in the House. HAL has other platforms which it has successfully mastered (Dhruv and variants) which it can commercialize first. Not saying that export is not a worthy goal, or any barbs at Tejas, but this is an unnecessary distraction at this point in time. This cautious mindset is what causes Indian programs to get ignored. Whether we like it or not, we have to start learning to work on multiple things in parallel. Setting a roadmap in terms of FOC, MK1A & MK2 by IAF provides a great support to LCA, when it needs to compete in the export market. Countries realise that it is getting inducted in large numbers (200 to 300) and there is a update pipeline already decided. This allows for easier spare support and availability of updates for a long time. JF17 though inducted in to PAF is fundamentally a export market jet, not inducted in it's home airforce PLAAF. Pakistan does not produce any parts, so why would Malaysia deal with them. More then the engine, Israeli radar and EW suite might be a problem in exporting the Tejas to countries like Malaysia and Indonesia. We need to have our own radar, EW suite and weapons package for the Tejas to succeed in the export market. On the weapons front, we are getting there with the Astra and an array of air to ground guided weapons coming up. Non guided bombs are already there. For laser guided, I guess the Tejas might have to qualified to Paveway II and Russian offering as well, apart from Griffin. Though I guess this should be doable. For WVR, R-73 is acceptable to most. For any other option, the buyer can pay for the integration cost. Looks like Malaysia is doing a RFI. It seems to called in T50, JF17, Gripen and now LCA. So i don't think they will buy LCA. This is just checking out the options. Given the 404 engine, chances are US may force Malaysia to buy F16, instead of giving approval for engine. I will just wait for the airshow flying. I don't think it is going further. Moreover if they do buy it.. chances are it would be going up against Singapore! It's not caution. It is realism, in terms of our own needs, capabilities measured by fielded units/track record, and honest understanding of what it takes to be a global player. LCA is not there yet. Dhruv is far ahead. There are various success stories with other governmental organizations. ISRO has been a major player for several years now, and the various rail factories are rediscovering their practice-honed abilities after decades of aiming low (refurbishing MG rolling stock for export to "poorer" nations). Wholly expected is the fact behind this news blip, which is that this is only an RFI with very strong and proven competitors. Don't get carried away with this report. the RMAF requirement is for a Lead-In Fighter Trainer which can also double as a light fighter..and while the Tejas has a trainer variant, there is a LOT of work to be done to make it reach the T-50 level or the M-346 level for the trainer role, in the simulator and ground training set up that KAI and Alenia already have a lot of experience with. Equipped with a good radar and superb FBW, the Tejas trainer is superior to the T-50 or TA-50 or the weaponised M-346 Master, but HAL has not yet gotten heavily involved in the ground training element or synthetic training onboard the trainer. This was an area where even HAL's test pilot Grp Cpt Muthanna had in an interview mentioned that there was plenty of scope. But the IAF had so far not shown any interest in using the Tejas trainer as anything other than a type conversion platform to train new pilots joining a squadron or for keeping squadron pilots current..the IAF could easily ask for 2 squadrons of Tejas trainers as LIFT optimized trainers and contract HAL to build the simulators and the ground debrief stations that . But in the absence of that happening, the RMAF will find the Tejas superior to all other light fighters bar the Gripen C, but it will fall short of the T-50 in terms of the simulators, syllabus and so on. And KAI has been aiming the T-50 at the RMAF for a lot longer, whereas HAL and the Indian MoD will be newcomers to this particular contest. Korea Aerospace Industies (KAI) is promoting its T-50 advanced jet trainer, light attack aircraft to Kuala Lumpur. KAI had a large stand at this year’s show at the Langkawi Internationa Maritime & Aerospace Exhibition. Its appearancec was also in support of the South Korean air force’s Black Eagles display team, which performed daily in the show’s flying display. The Black Eagles display with eight T-50B aircraft. It started using the type in 2009, having previously used the Cessna A-37 Dragonfly. There is a no formal requirement for new trainer aircraft in Malaysia, so KAI sees its presence at the show as mainly introductory in nature. The type fills two roles, both as an advanced jet trainer and a light attack aircraft. It is understood that all T-50 aircraft subsequently produced will be the FA-50 variant, which has a light attack capability with precision weapons, and a cannon. KAI has enjoyed strong success with the type in Southeast Asia, selling the aircraft to the Philippines, Thailand, and Indonesia. Kuala Lumpur has insufficient assets for training pilots, with just seven MB-339CM trainers – the eight aircraft crashed in May 2016, with both the pilot and co-pilot ejecting safely. A decision on new trainers is likely to be years away. 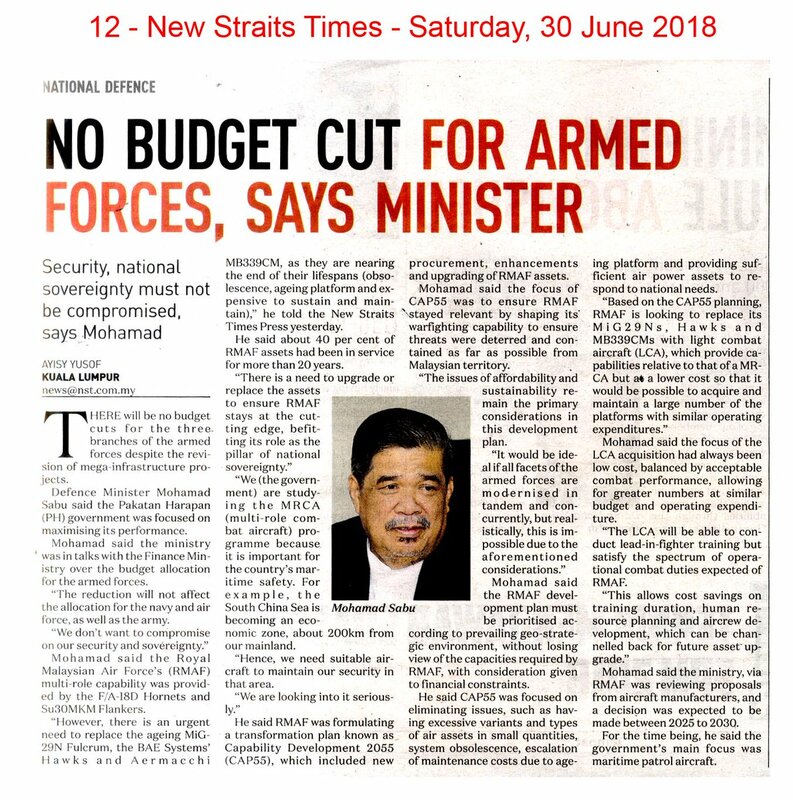 It is unlikely made until Kuala Lumpur selects a new fighter under the auspices of the Multi-role Combat Aircraft (MRCA) deal. The MRCA decision has been delayed for years, with no clarity on timelines. And please read this article fully- it has a wealth of info on what is needed to beat the T-50 if the requirement is primarily for a LIFT with some secondary light fighter capability and not the other way around. Also this article is worth reading because of its wealth of info..such a detailed evaluation ! I so wish someone like Craig Hoyle or someone with this level of insight would have done a test flight report on the SP Tejas Mk1..sadly Peter Collins, who did this T-50 evaluation is no more. Shook-Law is a first rate DDM. LCA is being called in for just for an evaluation and he sensationalizes the news as Malaysia 'may buy the LCA'. The article seems to suggest the selling point of the 2 seater LCA is as an "advanced trainer" which doubles up as a fighter - on a budget. Only a few aircraft in the world fit this profile. The F-5 was one - used as both aggressor squadron trainer and in various air forces. The Hawk tries to be one - but is a trainer. Various L-39 derivatives - also a subsonic trainer. Actually this marketing angle for the 2 seater LCA is pretty good and HAL should pump it for all its worth - advanced trainer & budget fighter. The JF-17 could also fit that role - but who'd be trusting China. Last edited by Neshant on 10 Jan 2019 08:56, edited 1 time in total. He is certainly quite the hack. An aircraft type which Malaysia is coincidentally referring to as the "light combat aircraft" is being misinterpreted as our own Tejas. There is no relationship here other than a common name. The T-50/F/A-50, and the M346 both have advanced trainer and light fighter elements depending via different variants. YAK-130 too also has an attack variant.T-50/F50 is supersonic while the others are high subsonic. All of them start off as advanced trainers so one huge disadvantage they are going to have compared to the LCA is going to be in the light fighter roles assuming that a potential export customer weighs that more heavily. They are top of the line advanced trainers though with a lot invested in that training element both live and virtual. Malaysia is also a Boeing F/A-18 operator so there is also a possibility, given their decision timeframe (2025-2030), that Boeing launches a trainer+light fighter variant of its T-X by then because some of the work needed for that conversion is going to be relevant to the USAF as well (aggressor role). If they value combat performance then it is tough to see how anything can compete with the LCA MK1A besides perhaps the Gripen. No other aircraft in this class will have the sensor or weapons combinations. If however, they value the advanced training mission more, then they have a lot more options. Neshant wrote: The JF-17 could also fit that role - but who'd be trusting China. JF-17 is a very potent aircraft and can fit in several roles, including a multi-multi role. It though needs to fly reliably first. It was a no-show in Bahrain and most likely will be a no-show in Malaysia. ^^lets be serious sir, JF17 is high flying in green crescent colours. They have 50 of these. It is so reliable that pakis are getting 250. Haven't you seen the TFTA videos? Regarding Bahrain, the pilot protested against killings in kashmir and didnt want to stand next to third grade pilots of IAF. So that their skills to dogfight ..oops disengage dont get destroyed. ArjunPandit wrote: ^^lets be serious sir, JF17 is high flying in green crescent colours. They have 50 of these. It is so reliable that pakis are getting 250. Haven't you seen the TFTA videos? Regarding Bahrain, the pilot protested against killings in kashmir and didnt want to stand next to third grade pilots of IAF. So that their skills to dogfight ..oops disengage dont get destroyed. Can't imagine Malaysia buying JF-17 and then hosting IAF Sukhois for training. They certainly will have less access to Indian facilities, spares, etc. It'd be a strategic mistake by them. ^^could it be for gauging the capabilities of JF17?? Can we stick to topic? This is turning into discussion for Malaysia RFI? There is intl thread for that. As LCA is eye'd for exports to other countries, comparisons will come up. And it is human tendency to reduce a platform to a point and then do a checkmark to checkmark comparison which is contradictory in its very nature. Such comparisons are useless. Currently the biggest issue is HALs inability to scale up production. This is a bottleneck which must be overcome. I am not a jingo does that make me less of a nationalist. Quiet satisfaction and pride is more my thing..
ks_sachin wrote: I am not a jingo does that make me less of a nationalist. Quiet satisfaction and pride is more my thing..